Last week, Columbia University professor David King ran a great response to the recent grousing about bike-share stations. He posted this graph depicting how public perceptions of congestion pricing programs change over time. An outfit called CURACAO (one of the weirdest, most tortured acronyms of all time — it’s short for “coordination of urban road-user charging organisational issues”) spent years analyzing various road-pricing attempts in Europe, including shifts in public opinion. This graph of theirs shows that the more people learn about congestion pricing, the more people feel vested in opposing it, and the less popular it becomes — until it’s implemented, after which everyone can see that it works, it becomes the new normal, and popularity climbs. 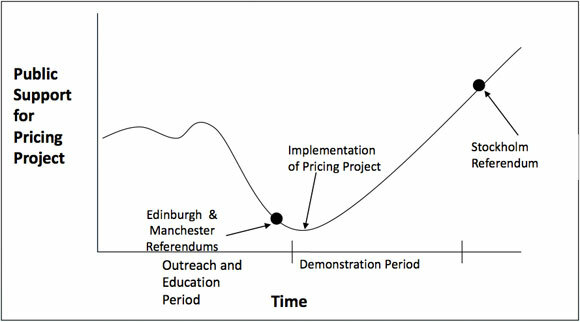 In Edinburgh and Manchester, voters rejected congestion pricing in referendums before they had a chance to see it in action. Stockholm did it differently, holding a six-month congestion pricing demonstration before asking residents to vote. Having seen the results of road pricing, voters decided to make it permanent. Transpose this pattern to NYC street redesigns, and it’s all the more impressive that the city manages to make changes, given the current community board process. DOT’s toolkit now includes materials that make possible inexpensive, temporary changes — demonstration projects, basically — but community boards are always asked to vote before any demonstration can be implemented. Vote after vote in favor of pedestrian safety upgrades, protected bike lanes, and bus lanes happened at the point of maximum resistance on this curve. Now imagine if all CB votes happened after a six-month demonstration. With regard to bike-share and the impending launch on Monday, I doubt the NIMBY noise about station placement signifies a broad drop in public support for the program, which consistently polls in the range of 70 percent approval. But we are at the point of maximum tabloid coverage, maximum litigation, and maximum resistance, such as it is. And in the long run, I think it’s fantastic that the NYC press corps is recording all these complaints for posterity. When bike-share reaches the point where it’s just a nice part of life in New York City, let’s not forget all the screaming headlines from spring 2013. They’re the proof that no matter how worthwhile or popular a given transportation reform might be, you have to overcome some resistance first. There have been plenty of examples of this during Janette Sadik-Khan’s tenure at NYC DOT. Remember the moaning about Fordham Road Select Bus Service, the Eighth Avenue protected bike lane, or the Times Square plazas? In the end those all turned out to be welcome, effective changes that worked well for local businesses. Bike-share is on a whole other scale — it’s freaking huge, and while it doesn’t cover nearly the whole city, New York’s political and media elite are going to see these bikes every day. If they all remember the media uproar of the pre-implementation period after the dust settles, that could help other street redesigns and transportation reforms move forward in the future. The next mayor could do so much to make city streets safer and more useful for New Yorkers — converting car-clogged arterial roads into transit boulevards, ramping up the Slow Zone program to cover many more neighborhoods, expanding the protected bike lane network into Queens and the Bronx. Whoever wins the election should remember what happened with bike-share. People are going to complain about process. People will sue. The tabloids will bluster. And it will be totally worth it. Enjoy the long weekend, Streetsblog readers, but come back here on Monday. We’ll have a bunch of Citi Bike coverage for you. I will not forget the NIMBY controversies as long as Streetsblog stays on the web; it’s all documented here! The problem is, before something exists people can make up anything and say it. And no one holds them accountable for what they said after the fact. I second Mr. Nieuwenhoven, and appreciate the second Weinermobile post. People have a right to change their mind. Except when their past pandering had consequences. Eloquently put, Ben. And just one more reminder why it’s important for all of us devotees to support Streetsblog’s ongoing work. I’m going to have a big glass of “Cool-Aid” (SIC) to drink before I get on my Citibike. So will 14,500 other bike cult members, fooled by the evil DOT/Emperor Bloomberg. Did I get it right? With the bikes not even rolling around yet, I think you make Ben’s point. Good article. It wouldn’t be NYC without push back. Yes. As someone who makes $500 an hour, but only when I’m actually **at** the client consult, I’d certainly rather spend a few dozen minutes waiting in cross-town traffic behind people driving to the hair dresser or the laundromat or their job as a cook – than pay $50 in a congestion charge. Please educate us Guest. Where are the parallels, and where do they diverge? People balked similarly when the government wanted to put fluoride in the water. Where are the protests now? Guest-do you even have a clue as to the multiple ways bike share could change things in this city? If so, then you’re probably the only one around here who does. A lot of people have talked about how they *think* bike share will fit in, but in the end nobody really knows exactly what will happen. As with all new things, often they end up being useful in ways nobody ever anticipated. Case in point-the Internet. It originally started as a means for academics to share research data. It evolved into a means of empowerment for common people, and also a medium to exchange goods and ideas. It’ll undoubtably evolve even further. Who knows where bike share will take us? I don’t. You don’t. It’ll probably change things in ways we couldn’t even imagine. You’re increasing people’s radius of travel by a factor of three to five compared to what they can cover on foot. And with the continuing evolution of human-powered transport we may eventually increase that by a factor of ten. We’ve talked for decades about PRT (personal rapid transit) systems. None have been built on anything but a small scale due to the logistics and cost and complexity. Maybe we went about it all wrong, and bike share is the PRT system which works on a large scale. Just build some exclusive guideways just for bikes, plus the network of existing roads, and there you have it. Larger systems tend to have complex nuances smaller ones don’t. We can see how other bike share systems work, but ours may eventually be five or ten times bigger. That might approach some critical mass which makes it useful in novel ways. Why should we want these changes? The City is great as it is. Who are you to dictate to i8 million innocemt NYers what they should want? Dictating? No, we’re giving NYers another option to get around. Nobody is being forced to use it. I fail to see why you’re finding a problem where there is none. Your comments show a single-minded lack of imagination. Open discussion is fine here and is never blocked by the moderators. Trolling isn’t. When people post garbage about drinking the Kool-Aid and similar loaded comments they’re going to be blocked. If you want to “discuss” things at that level try the comments sections of Yahoo news articles, or maybe the NY Post. Those seem to be rampant with morons posting inflammatory crap and calling each other names like 3rd graders. Most people here are fine with contrary opinions so long as people express themselves like adults. Heaven knows how many times I’ve vehemently disagreed with the majority opinion here, including on the design of the Citibikes and the location of the stations. I just keep my comments civil, and listen to what the other side has to say. If in the end we agree to disagree, that’s fine. More often than not each side might learn something from the other. That’s a give and take discussion. The very fact that anyone who opposes this thing, the size of it, or it’s implementation is name-called NIMBYs here pretty much proves Guest’s point. Civilized discussion? What, with these cranky old NIMBYs??? Whatever for? Streetsblog? NY Post? All bikes! No bikes! Mirror images, if you ask me. We’ve had plenty of “civilized” discussions on bike share here where not everyone was in agreement. The NIMBY label appears to be reserved for people who are inventing problems before bike share even starts. I’m referring to people posting garbage like bike share will cause mayhem on the streets with thousands of bikes killing untold numbers of people and pets (that’s not an exact quote but a reflection of the type of posting which merits the poster being labeled a NIMBY). Anyone wanting to debate the finer points of the system has never had a problem. If you want to come on here screaming that your grandmother died of a heart attack because a bike share station blocked the paramedics, yes, you’re going to be called out for it. Unlike some other venues, hyperbole and anecdotes aren’t taken as gospel here. You might also discover that it’s possible to support something as a concept even if you’re less than enthusiastic about the way it’s implemented. I would have liked bike share stations in places where there is little mass transit, like the outer fringes of the outer boroughs, for example. And I thought the bike share bikes should have used airless tires and had a wider gearing range. Despite that, I’m willing to support bike share in its current form because I feel it will still be useful to many people even if it isn’t to me. And I’ve been quite critical of a lot of the city’s cycling infrastructure even though in principal I support the idea of separate bicycle infrastructure. The so-called NIMBYs are those who reflexively oppose anything which is either not useful to them personally, or inconveniences them in the slightest. That kind of attitude has no place is a big, crowded city where EVERYONE has to make compromises for the common good. I don’t much like dodging motor vehicles or looking at rows of parking cars, but I realize those are useful to some who live here. I would like that courtesy returned by those who might not find bicycles all that useful. You’re right, the city is perfect in every way and should never ever change. If EVERYONE has to make compromises for the common good, why is name calling acceptable? Just because there are (I think big) problems with the way that this thing has been handled and implemented so far, does not make me a NIMBY. So knock it off, oh those so enamored of this great corporate ad program, oh, sorry, I meant great bike share program. And anyone who talks about legitimate issues with the bike share program won’t be called names. Let’s not forget all the predictions of certain doom before Times Square was converted into a pedestrian plaza. I think the same applies here. I agree with nicknny that “there are problems with the way that this thing has been handled and implemented so far”: I think it should have been even BIGGER and should have been rolled out sooner. I would have liked Phase I to take place in full with 10,000 bikes and 600 stations instead of being scaled back to 6,000 bikes and 330 stations. I would have liked bikeshare to launch over a year ago in early Spring 2012 which was the original plan before three delays (1. trouble finding a sponsor, 2. trouble with Alta’s new software company, 3. damage from storm Sandy). I would have liked there to be a plan in place for Phase II which would be the expansion to 30,000 bikes and three times as much area included. I promise you: Bloomberg and all his friends will be laughing at all the corporate CITIBANK bike riding clowns from behind the tinted windows of their climate controlled SUV’s. Make sure you wave as we blast by you ! Yup, and all the placard holding members of the political/union class will be blasting by on their way to their reserved private parking on public streets. The difference is, the executive financial class seems willing to give the serfs SOMETHING — a bike to ride. And we’ll be healthier for it. 100 bucks a year / 10 dollars a day ain’t exactly giving anything away. You can purchase a decent condition bike for a hundred bucks and not have to suffer the indignity of rolling around on a tacky bank ad. If you don’t think it’s a good deal, then don’t sign up for it. Nobody’s forcing you. Over 10,000 New Yorkers apparently think it’s a good enough deal that they signed up before it even started. Personally, I think the annual membership is a steal, but alas I have no use for an annual membership. And I do think the daily membership is a ripoff, as I’ve argued on this website several times. So I don’t expect to make any use of bikeshare myself. But if others find it useful, it’s no skin off my back. The fact that they have no plan to ever place these bikes on the upper west or east side tells me all I need to know about this scam. Take it easy with the sarcasm – it’s really not necessary and it makes you seem lame which I’m sure you’re not. If you look at the maps link @ Citibikenyc.com, they don’t have any sites on the UES or UWS for future locations. That link only shows the first phase. Other phases are planned. Again, if you don’t want to use it, don’t use it. I’m not going to use it either, but I see no reason to stand in the way of the 17,000 New Yorkers who have already signed up or of the many more New Yorkers and visitors who will sign up in the future.